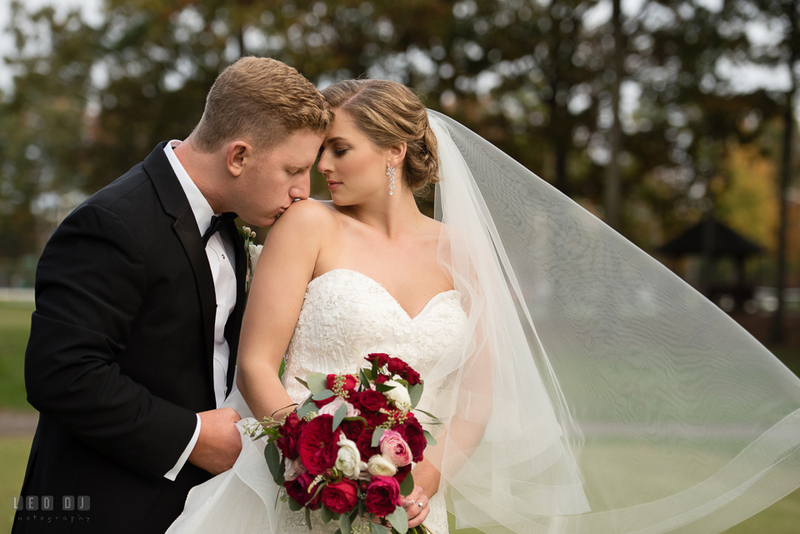 It sure was memorable when I did Shelley and Troy’s engagement session at Cape Henlopen and Lewes Delaware. 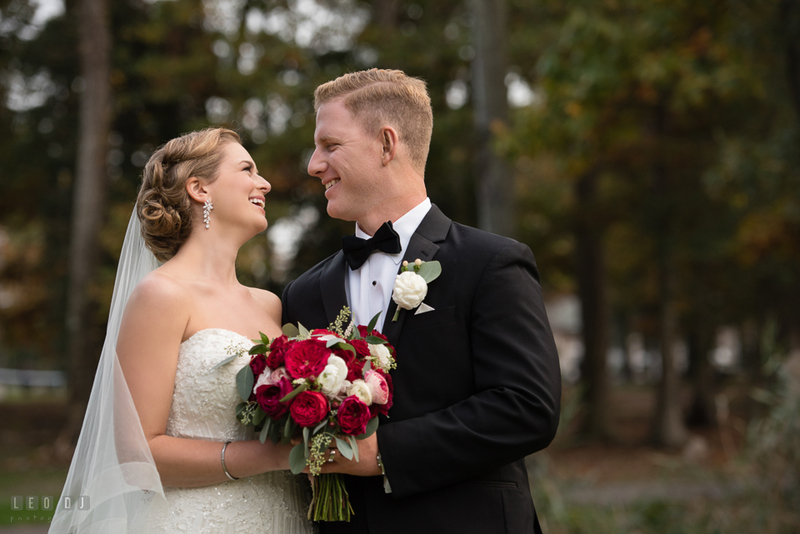 Since then, I looked forward to work with this awesome couple at their wedding, which would be at the Prospect Bay Country Club, Grasonville, Maryland. 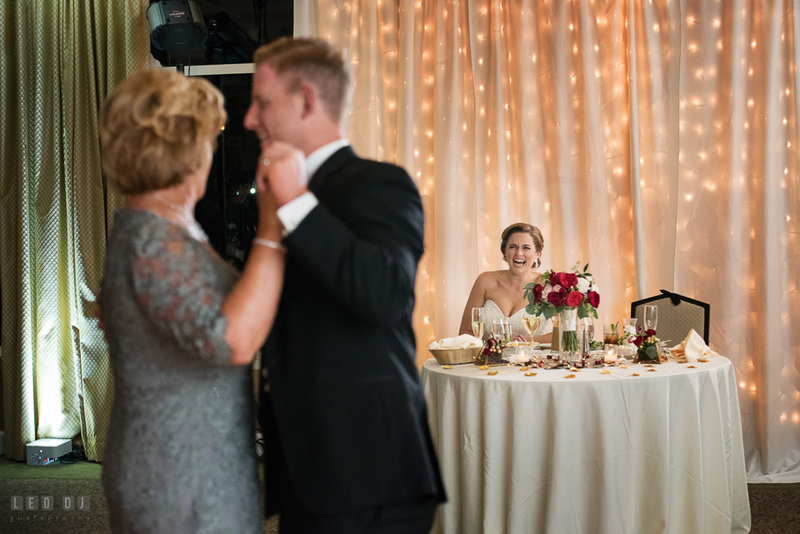 Shelley and Troy picked Prospect Bay to enable all of their family and friends to celebrate their happy day. 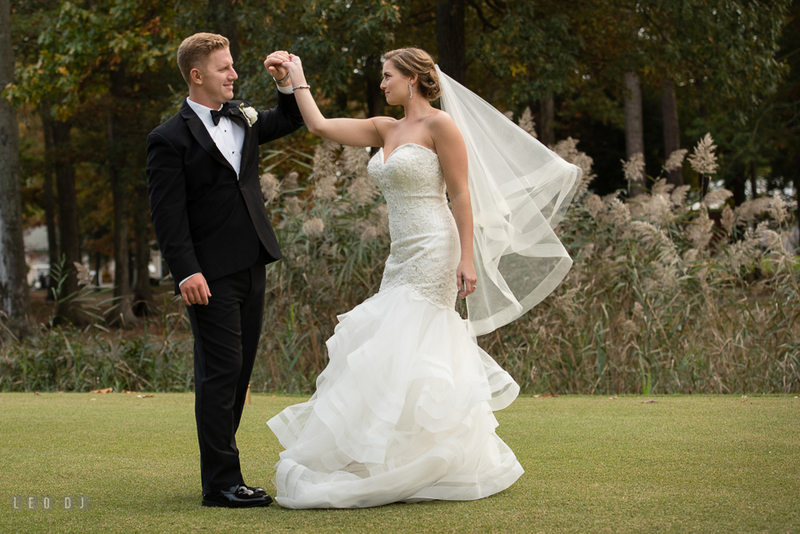 Halfway between both of their hometowns was Grasonville. 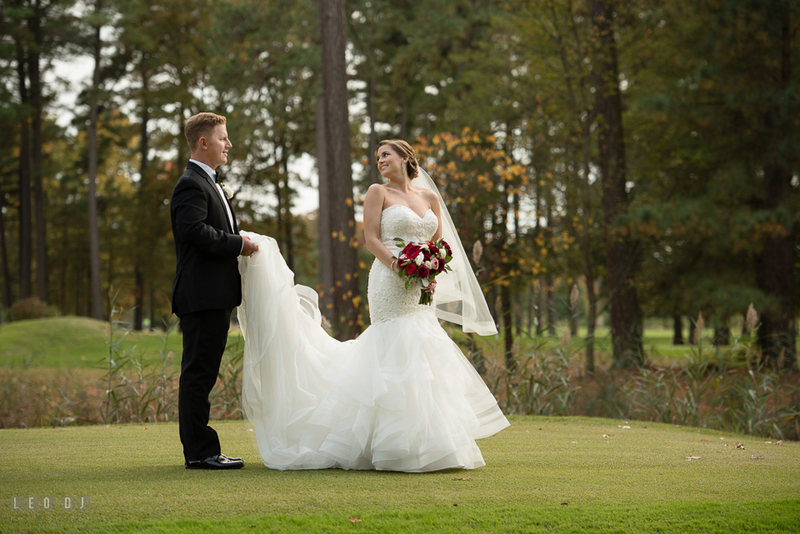 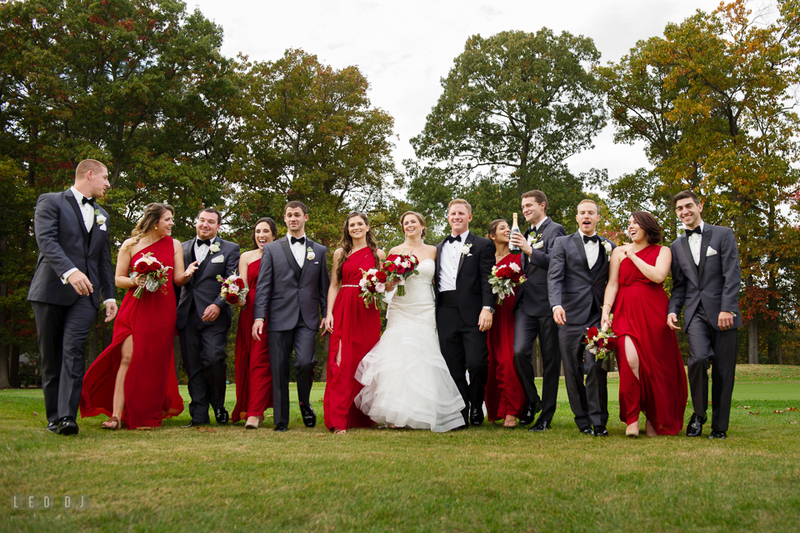 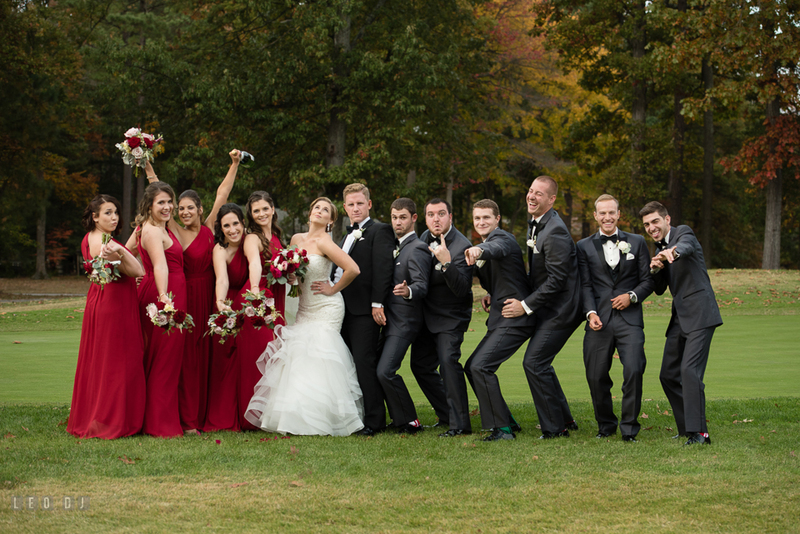 The first time they visited it, they fell for the views, and with all the trees and landscape in full color, it would provide the amazing backdrop for their beautiful fall wedding. 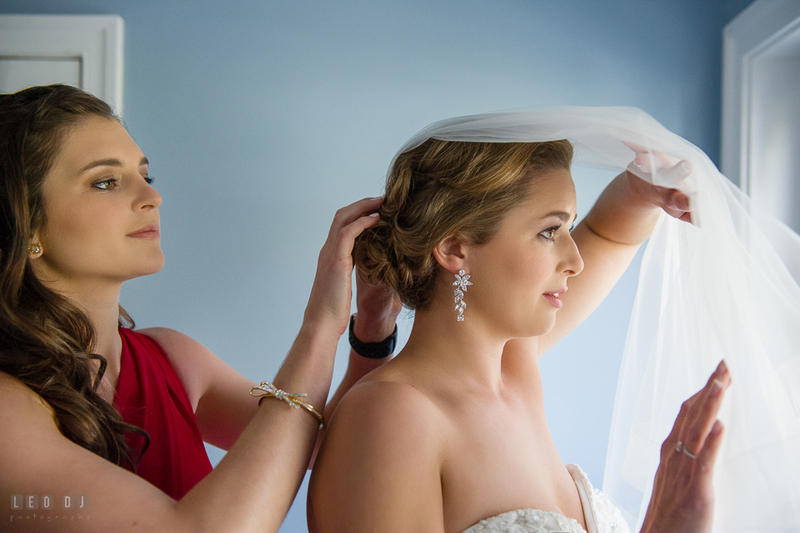 The team from Beautiful Discovery Salon did a great job for the Bride’s hairdo and make up. 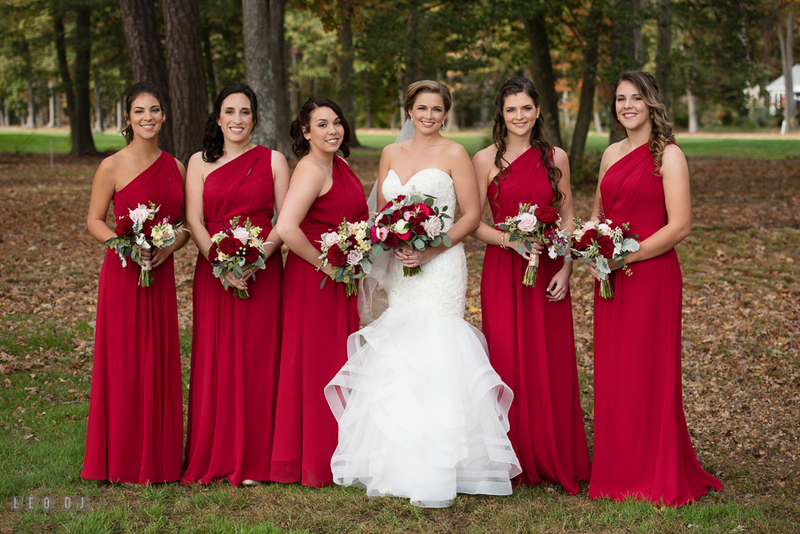 The Bride wanted to have some photos with her Maid of Honor and Bridesmaids in their robes. 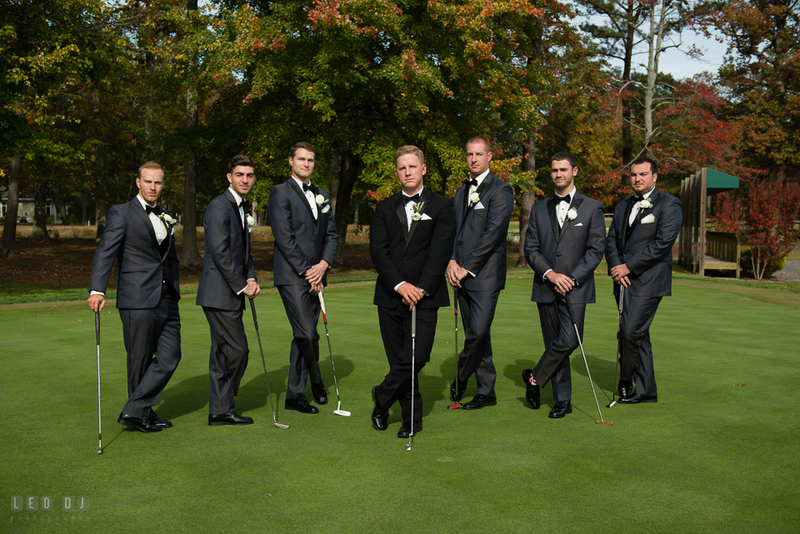 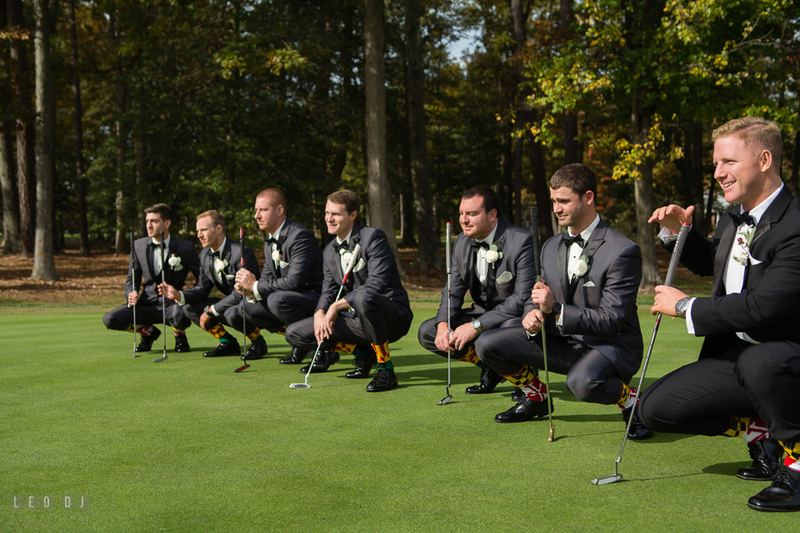 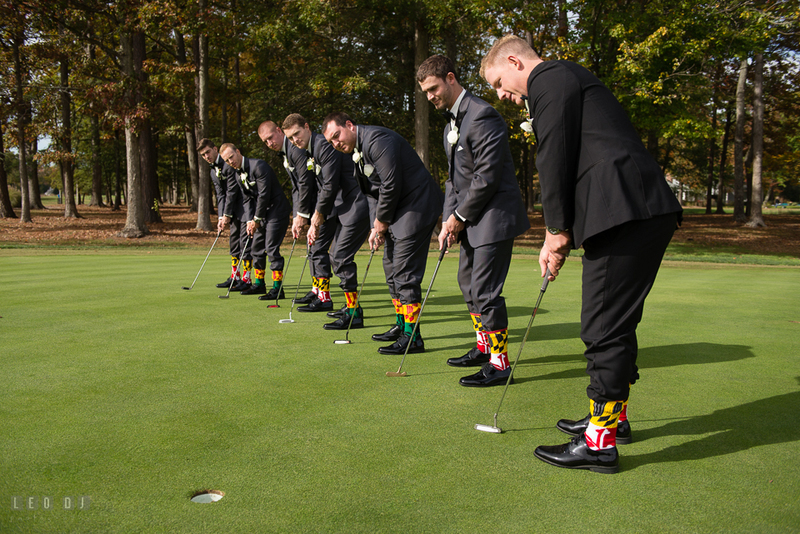 As for the Groom, he wanted some photos with his Best Man and Groomsmen in their matching Maryland state flag socks along with their golf clubs. 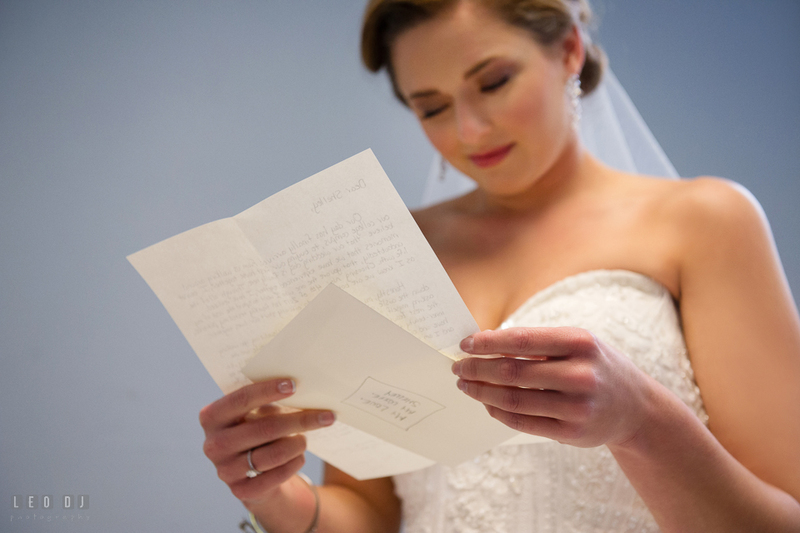 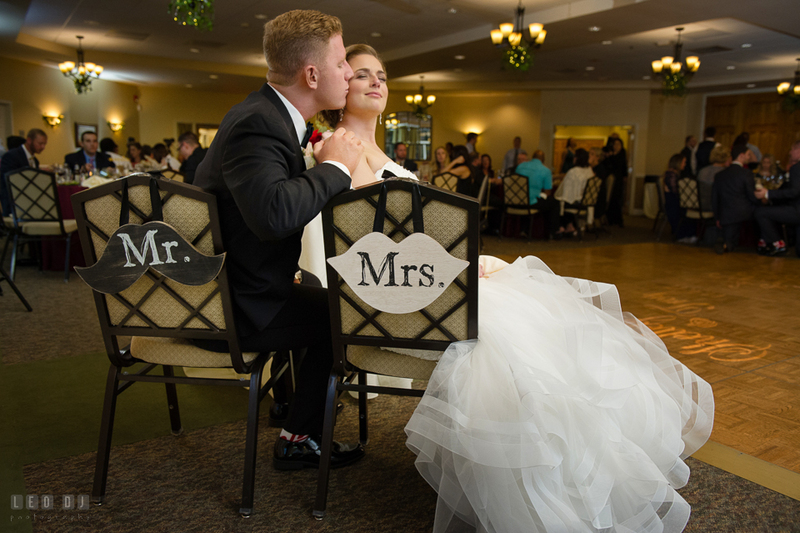 Shelley and Troy gave each other a letter to read before they tied the knot. 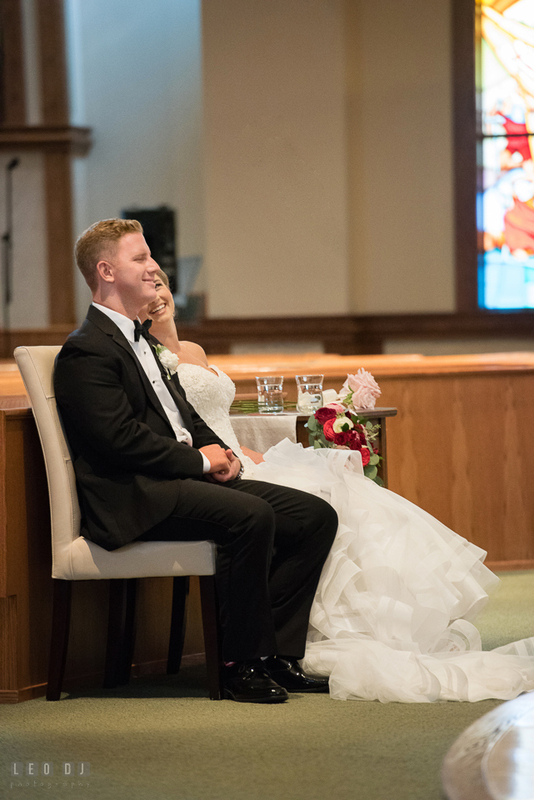 The Bride and Groom did not want to do a first look before the ceremony, but wanted to hold hands instead and say few words. 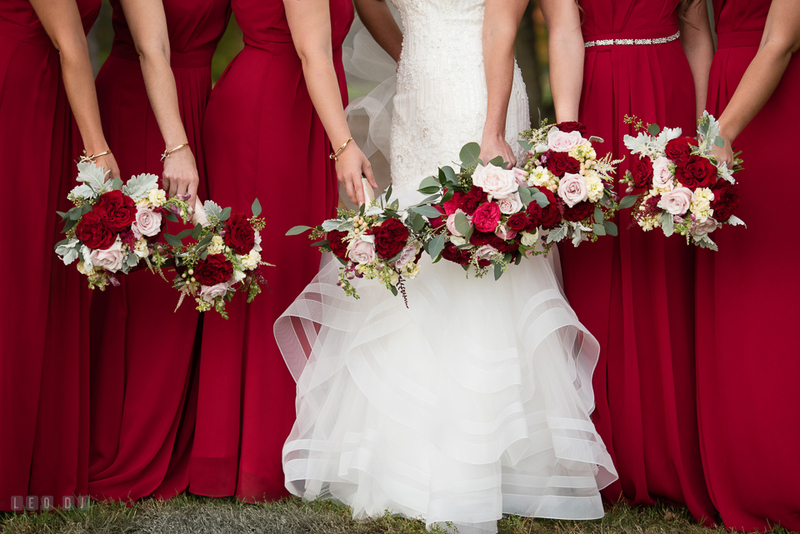 These gorgeous flower bouquets for the Bride and the Bridesmaids were arranged by Sherwood Florist. 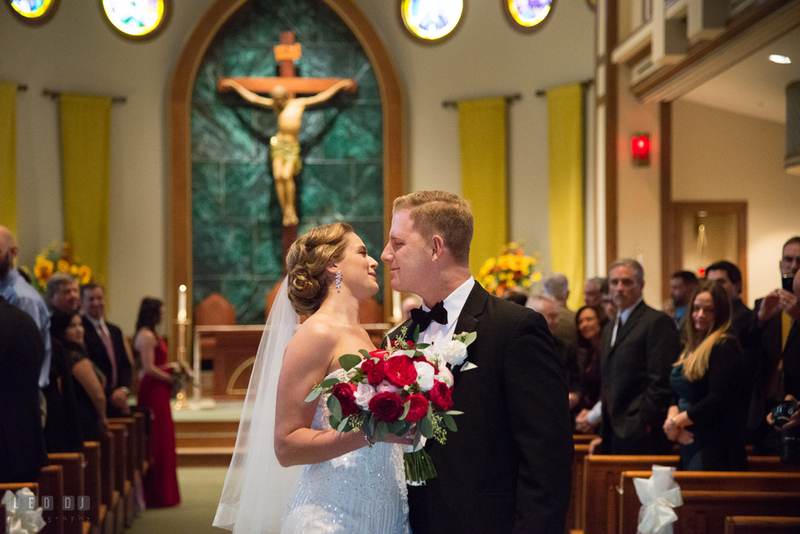 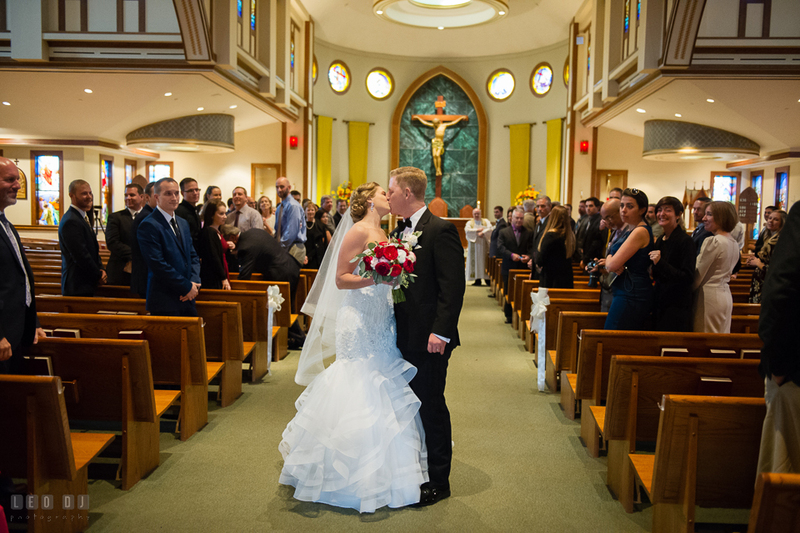 Finally, at the Saint’s Peter and Paul Church, they saw each other for the first time in their wedding attire. 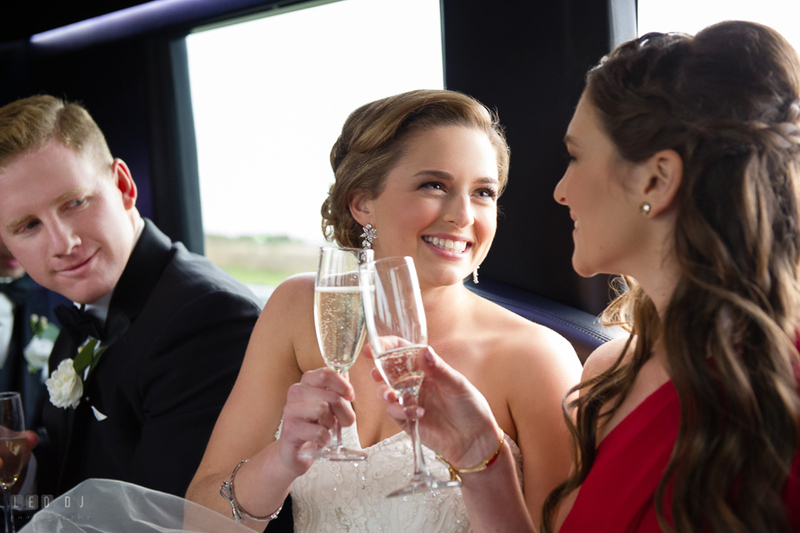 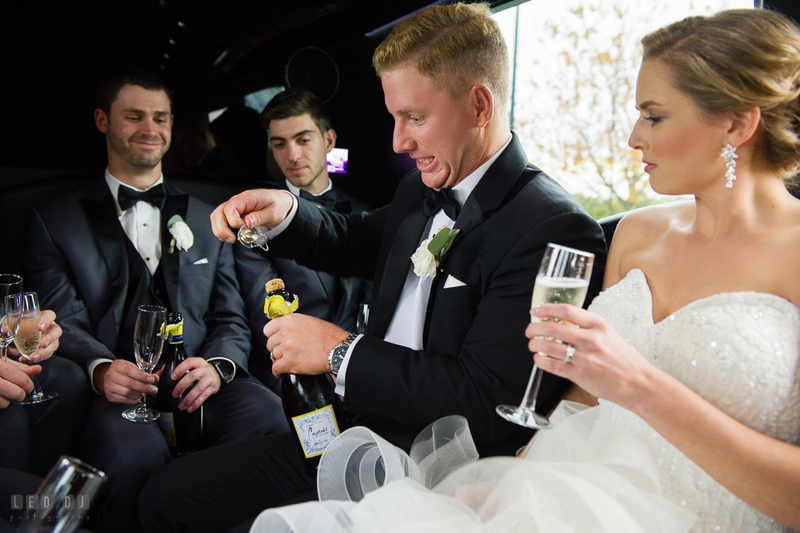 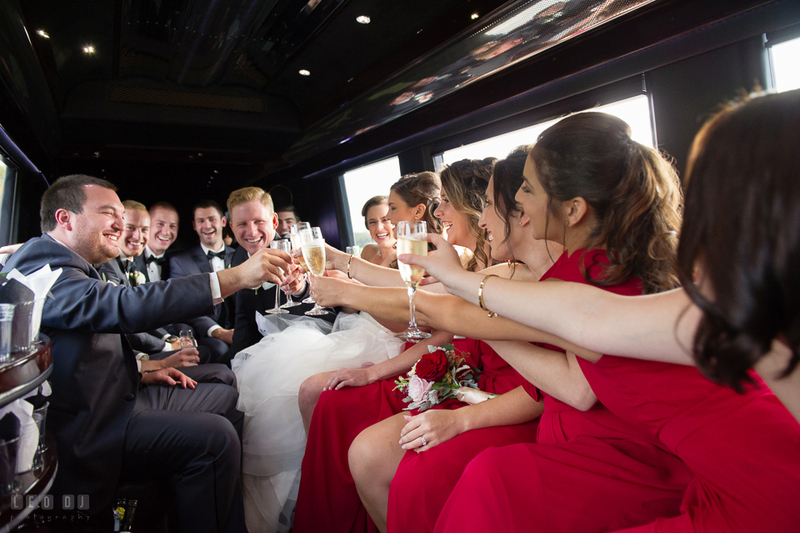 In the limo from Coastal Limousines, the Bride, Groom, and the wedding party had a little fun celebration with the complimentary champagnes. 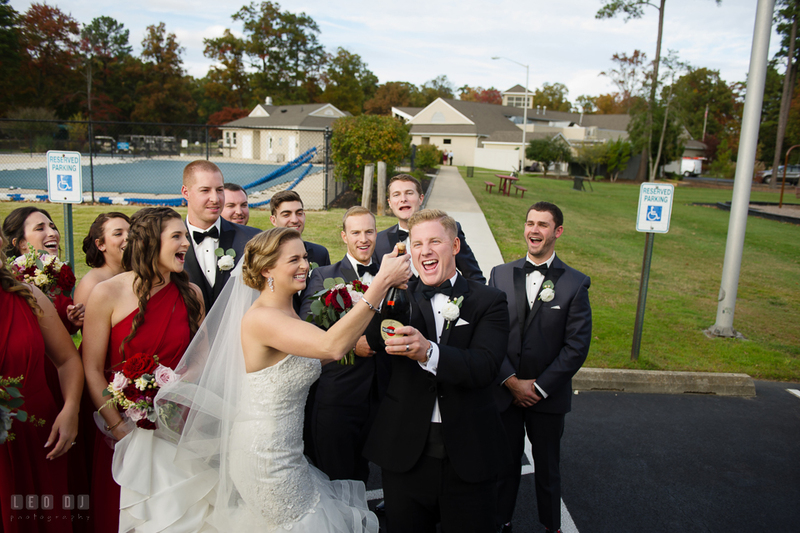 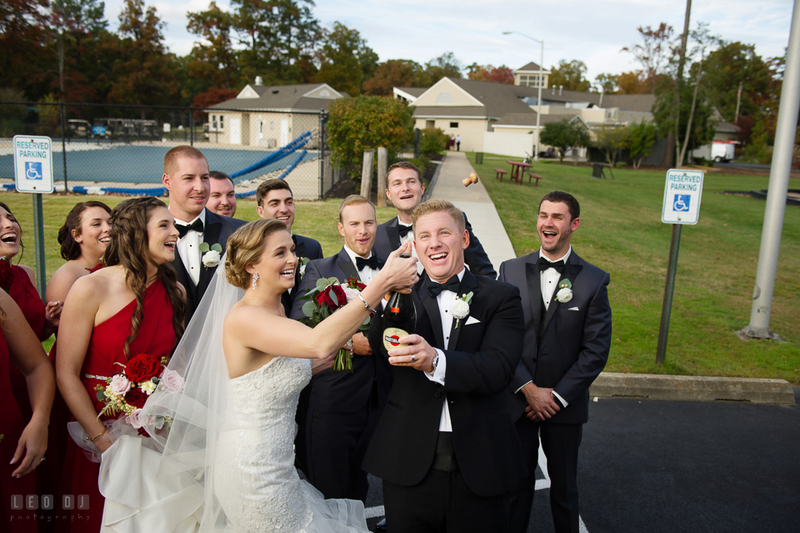 Upon arrival at the venue, the Bride and Groom opened last champagne bottle! 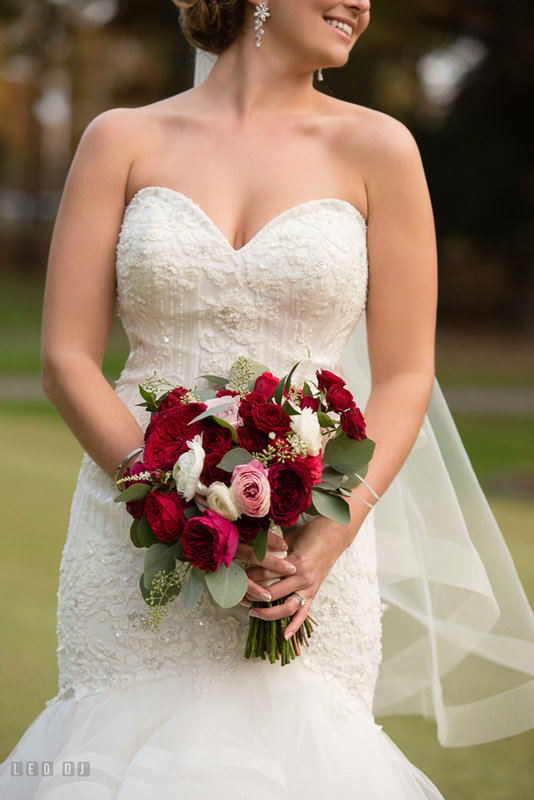 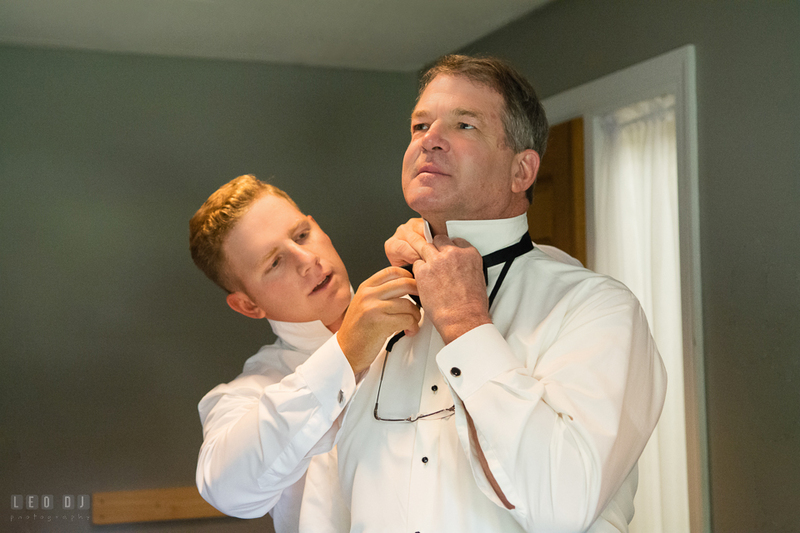 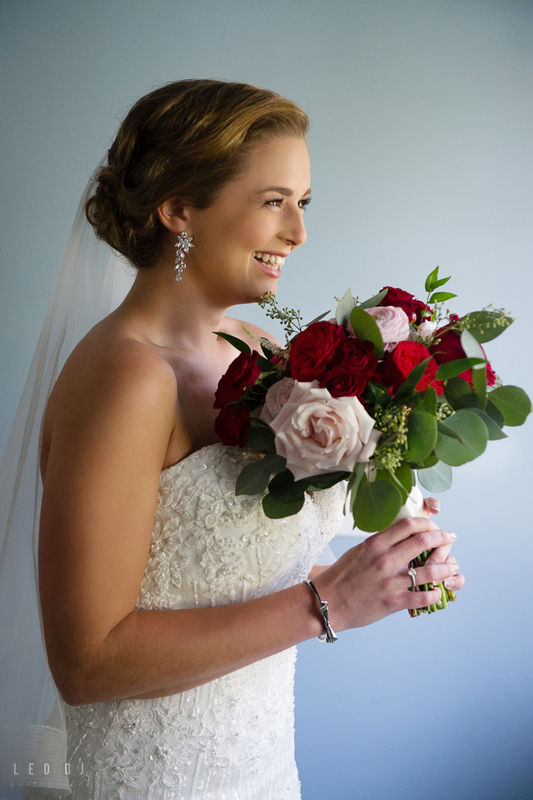 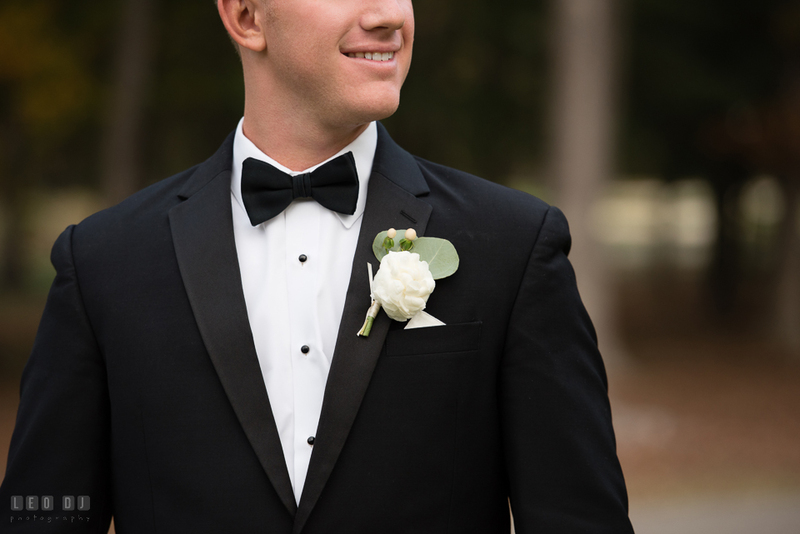 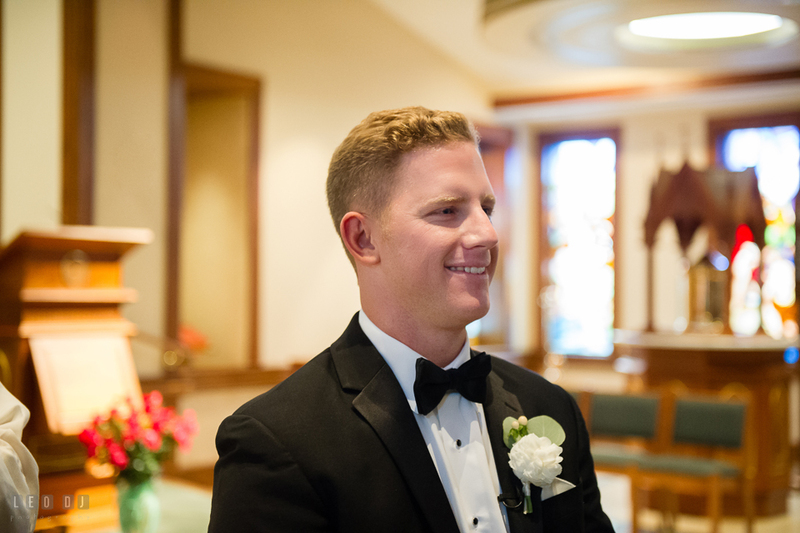 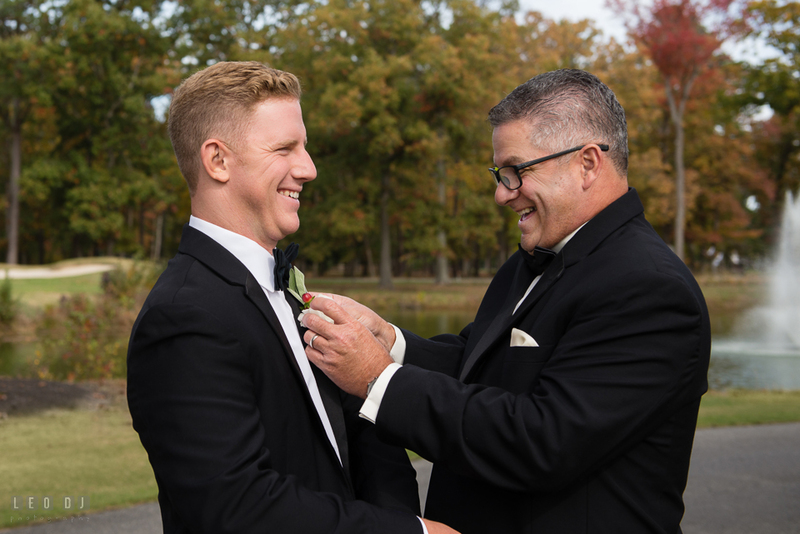 The Groom was wearing a simple yet elegant boutonniere, designed by Sherwood Florist. 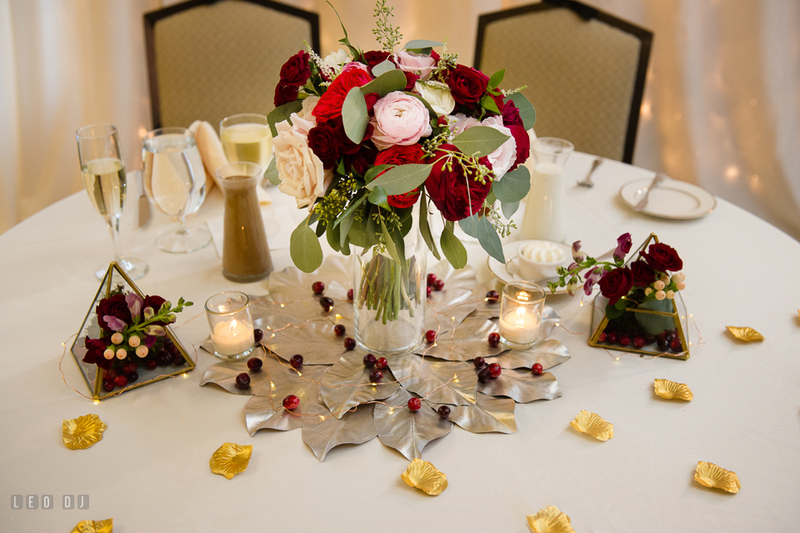 All the table centerpieces including the sweetheart table also had decor and floral arrangements from Sherwood Florist. 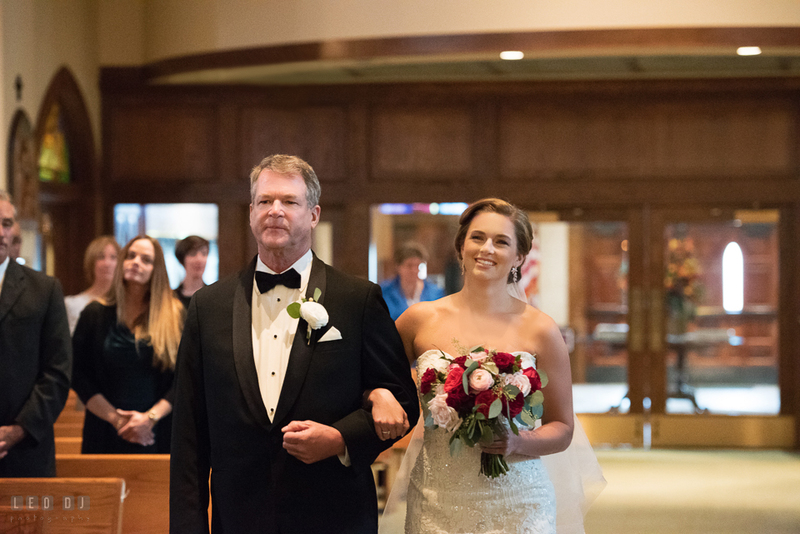 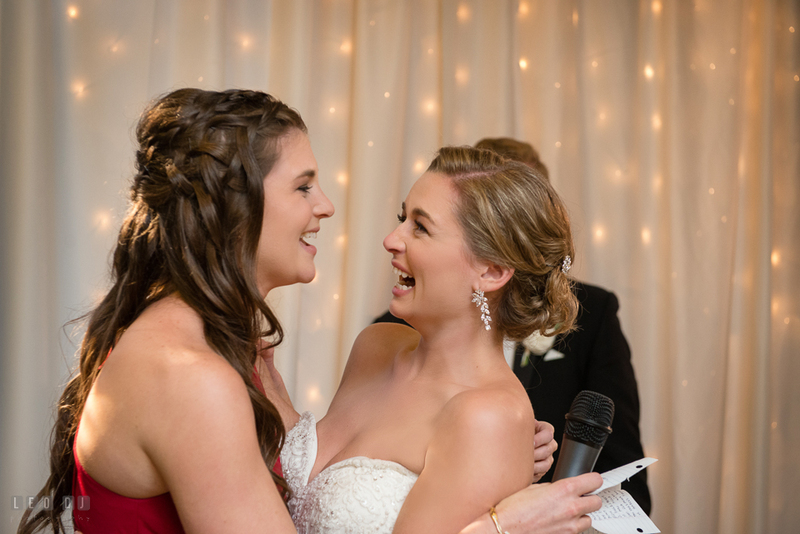 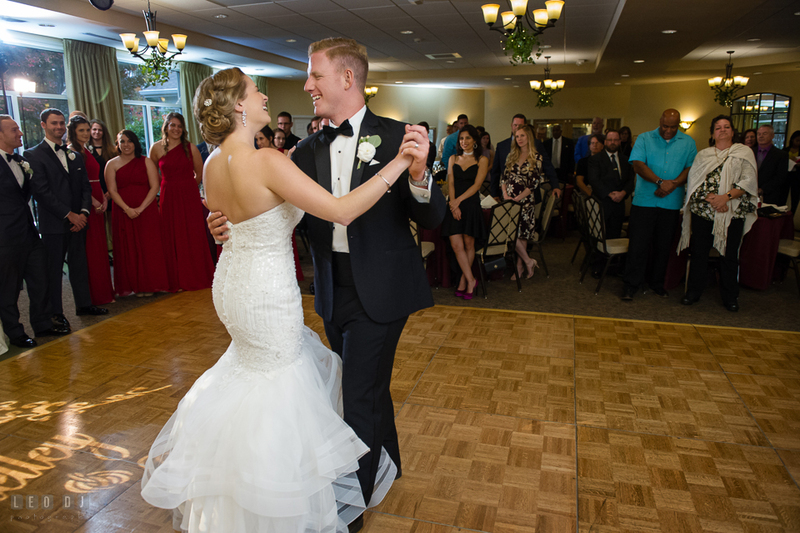 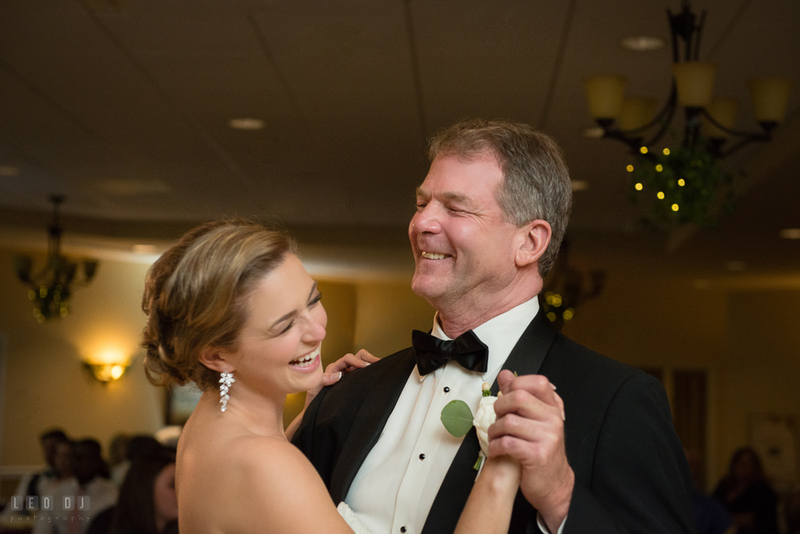 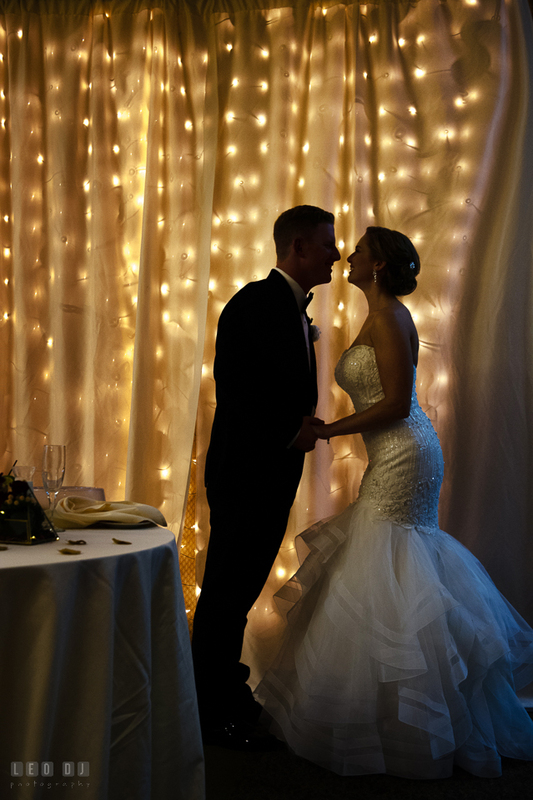 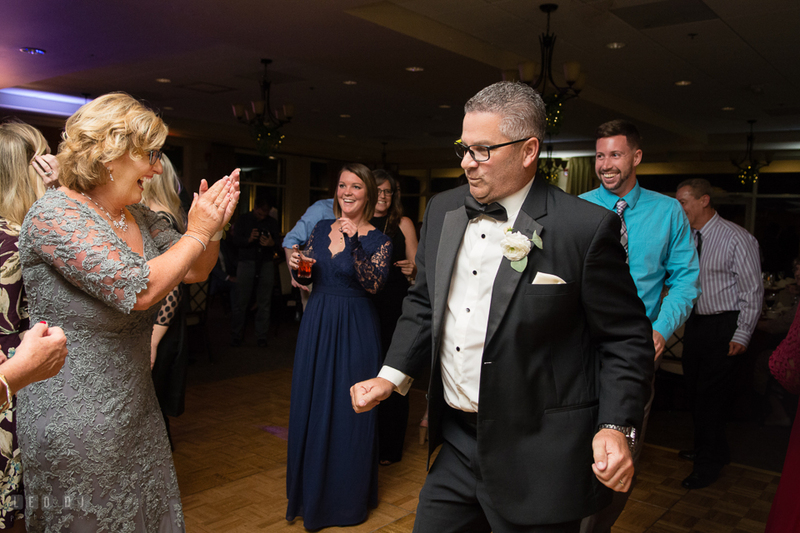 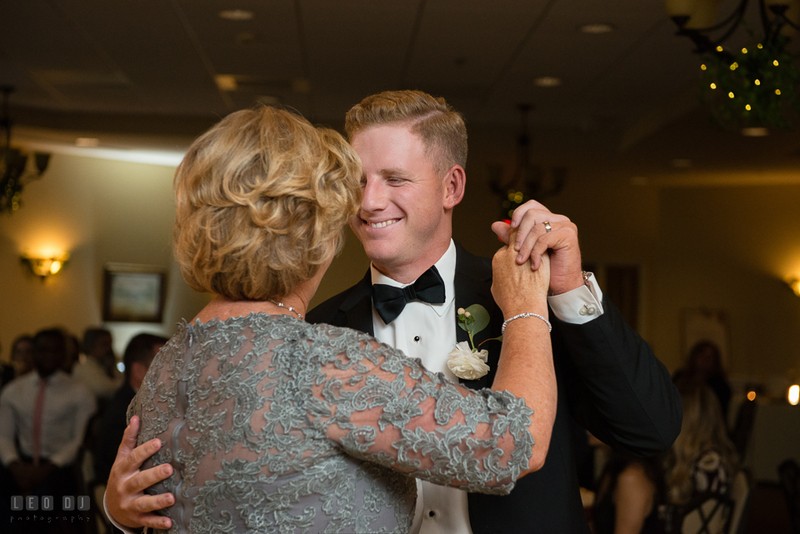 I just love seeing all the love and tender moments shown during the first dance, father-daughter dance, mother-son dance, and speeches from the Maid of Honor, Best Man, and Father of the Bride. 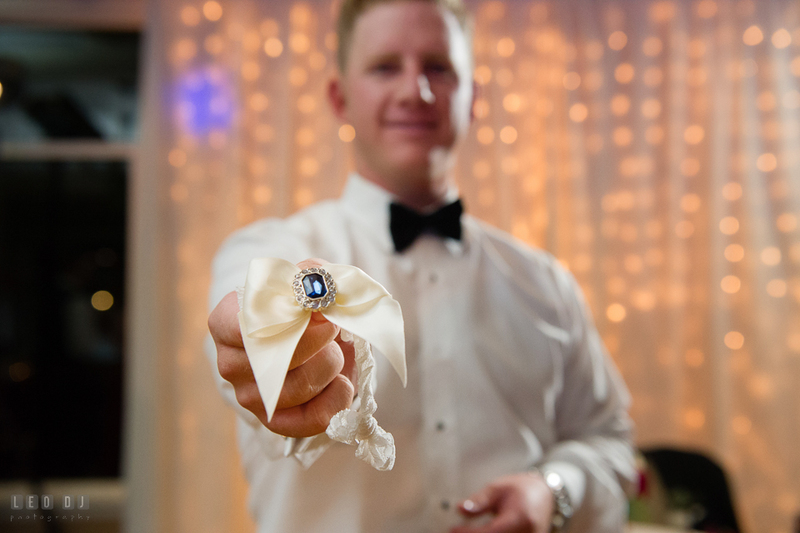 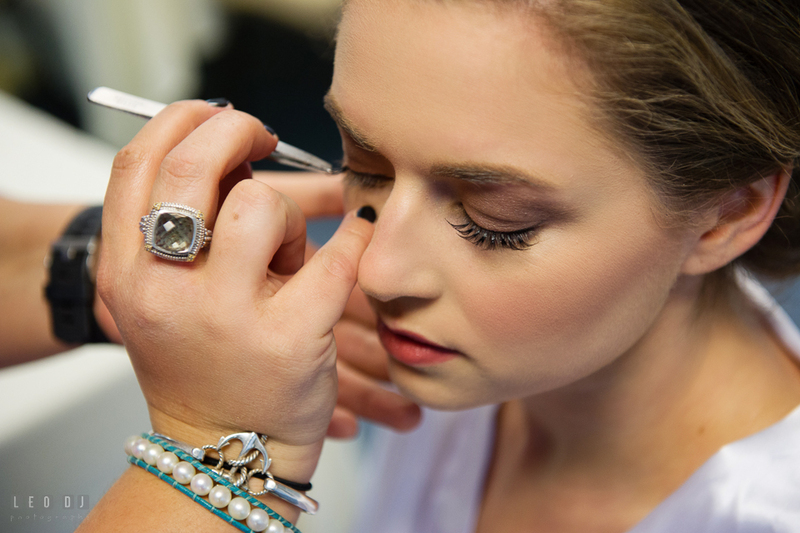 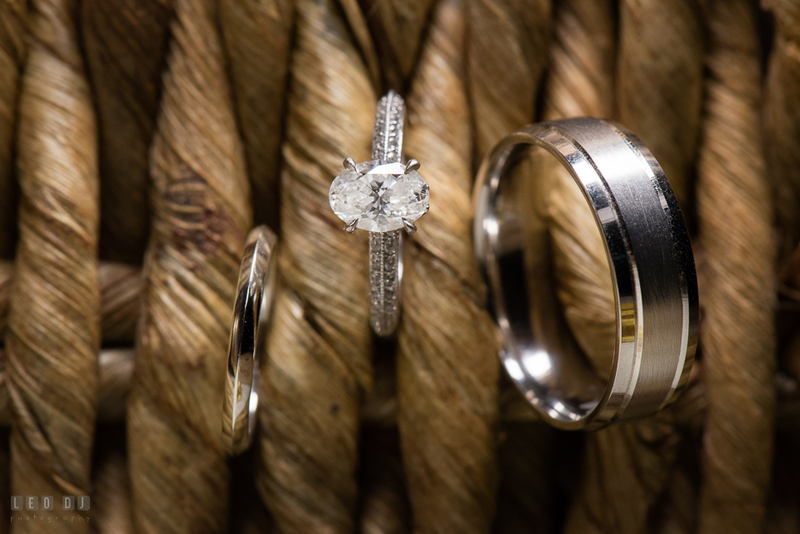 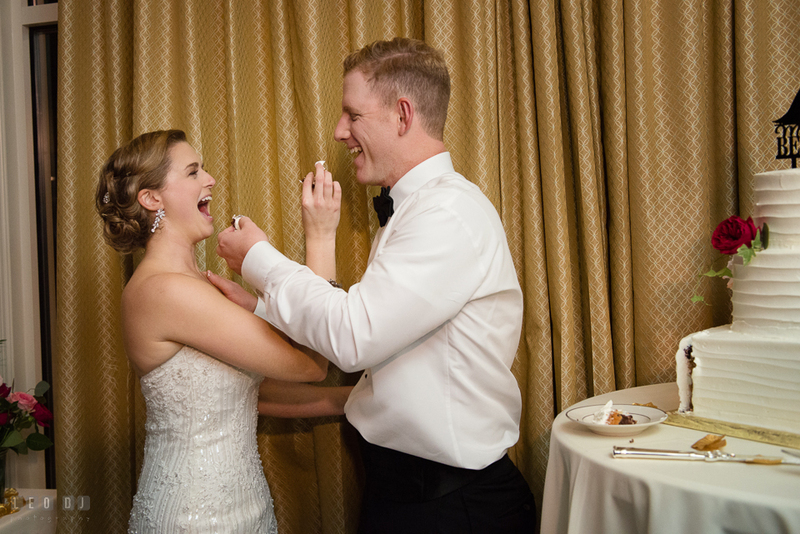 Shelley and Troy wore elegant wedding bands and engagement ring with oval-shaped diamond. 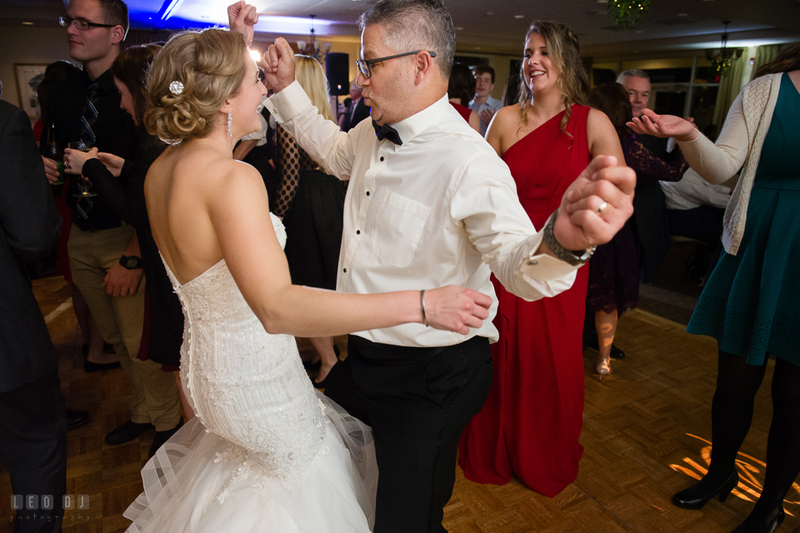 I took pleasure in watching all the guests having fun with the music mixed by the DJ from Steve Moody’s Entertainment Connection. 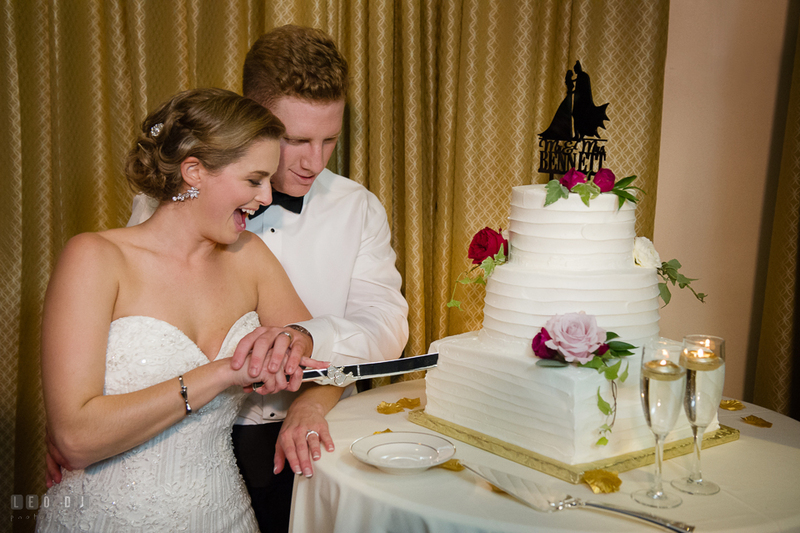 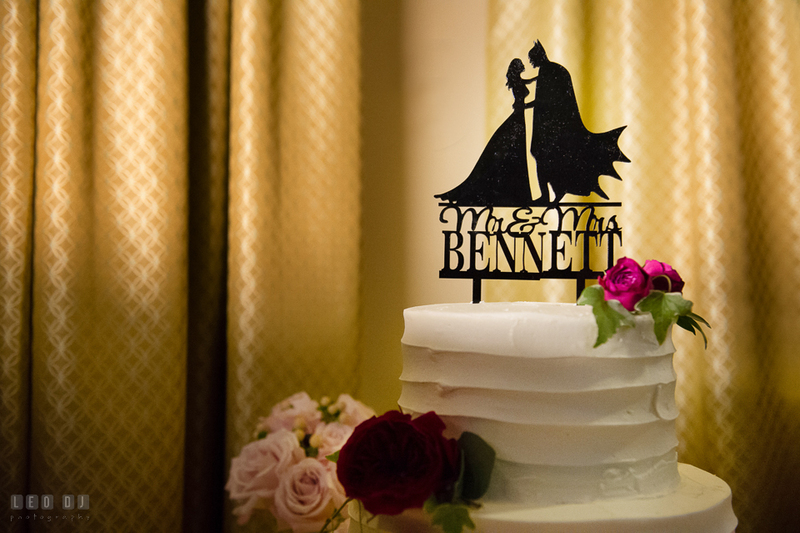 The three-tiered wedding cake was provided by Julie Bakes. 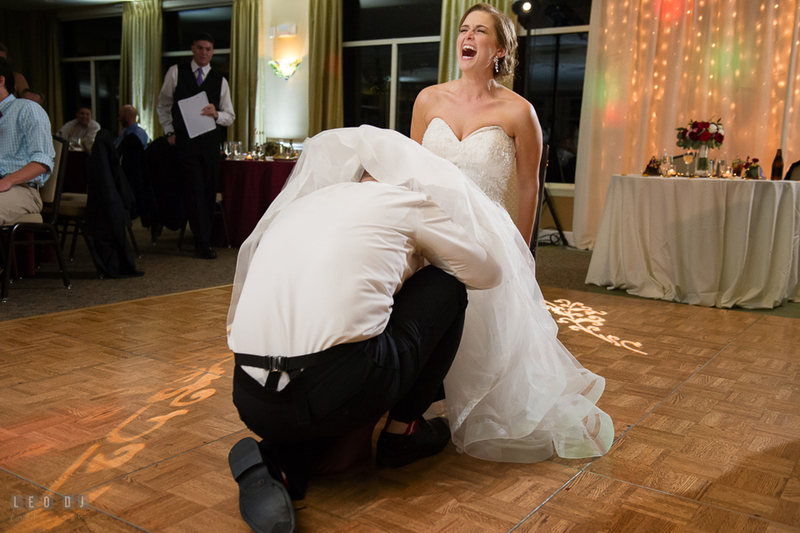 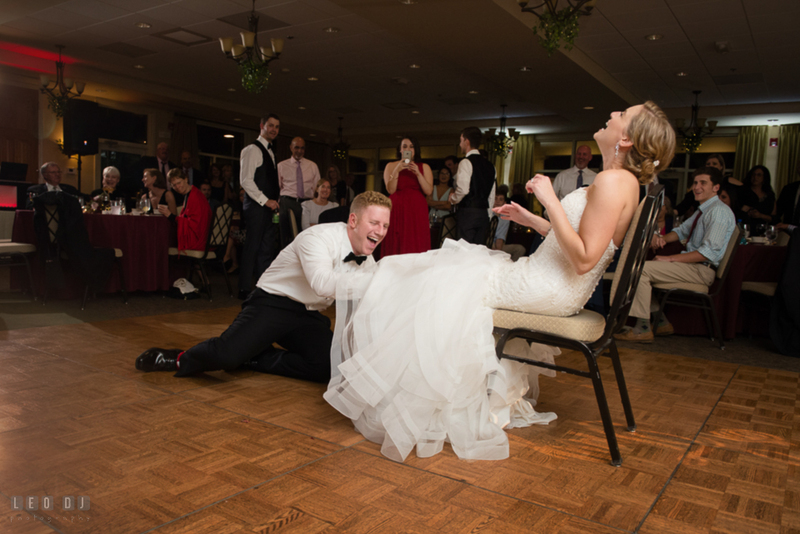 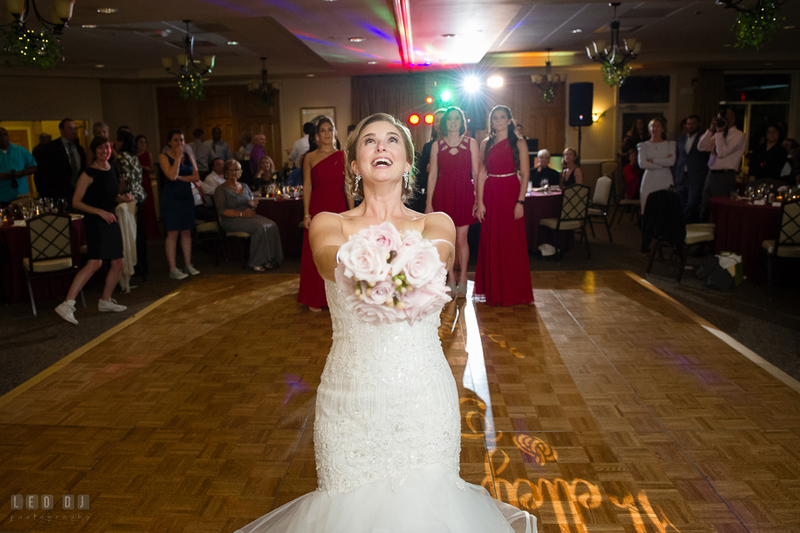 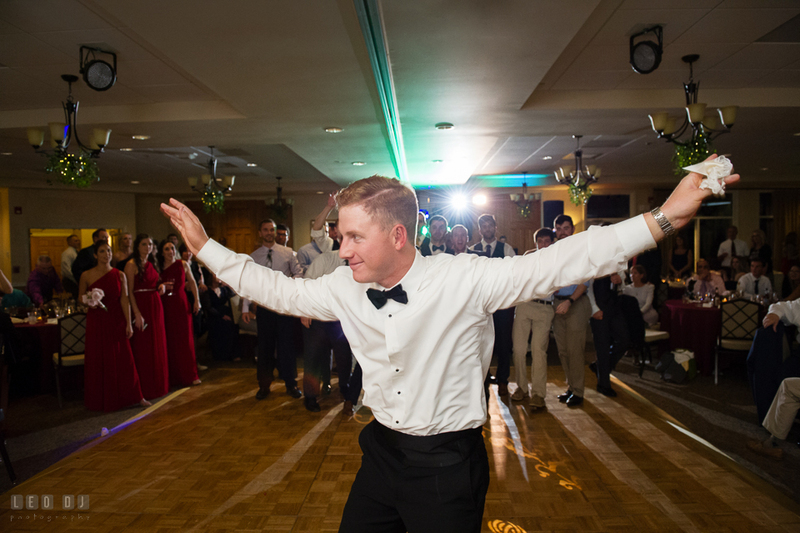 There sure was a lot of action and fun moments during the bouquet and garter toss sequences. 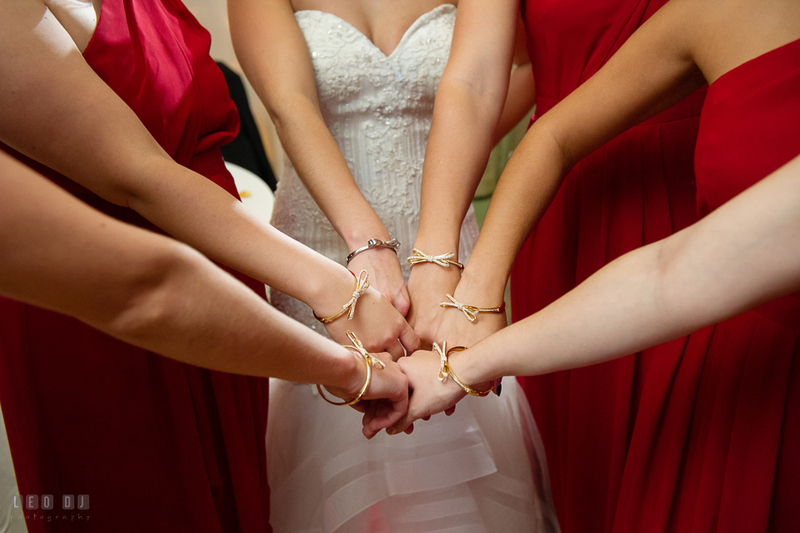 The Bridesmaids wore matching bracelets, a gift from the Bride.